Reverend W. Becket Soule, O.P. 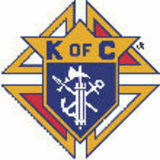 The Knights of Columbus presents The Veritas Series â&#x20AC;&#x153;Proclaiming the Faith in the Third Millenniumâ&#x20AC;? ccording to statistics compiled by the Vatican from Catholic dioceses around the world, diocesan tribunals completed 49,233 cases for nullity of marriage in 2006. Tribunals in the United States were responsible for more than 27,000 of those cases; this percentage of cases handled in the United States (fluctuating between 55 and 70 percent) has remained about the same over the past 30 years. This is an astronomical increase, for in 1968 only 338 annulments were granted in the United States. This number, despite its remarkable growth over the past several years, represents only a fraction of the estimated 10 million divorced Catholics in the United States, this number increasing by about 200,000 each year. Is an annulment merely a “Catholic divorce”? How can the Church give out so many annulments and still maintain its teaching that marriage is a permanent union between a man and a woman? How is the Church attempting to respond in compassion and justice to the needs of the millions of Catholics around the world who have divorced and experienced the personal tragedy of failure within an intimate union such as marriage? sanction of excommunication for this reason. This was the case in the United States until 1977. The penalty of excommunication was imposed exclusively within the United States by an ecclesiastical council in 1884. However, since the revision of the procedures for annulments and the promulgation of the two new codes of canon law, no one is any longer subject to such a penalty. Because a person divorced and remarried without a declaration of nullity for the prior union cannot be considered to be living in a state of life that mirrors the union between Christ and the Church which is signified by the Eucharist, such a person is not permitted to receive Holy Communion until their marital status is resolved. This is, however, not the result of the public imposition or declaration of an ecclesiastical penalty, but rather the result and consequence of the person’s public circumstances and behavior. here are three ways in which Church law (also referred to as “canon law”) recognizes that a true and valid marriage does not exist in a previous union: 1) where there was a lack or defect of what is called “canonical form.” 2) where there was an impediment to the marriage. 3) where there was a defect in the consent exchanged between the partners (the most significant in the majority of cases). would not be recognized as valid by the Catholic Church because of a “lack of form.” The one exception to this is marriage before a priest of an Orthodox church (e.g., a Greek Orthodox priest). Since the requirement of canonical form is a law of the Catholic Church, it applies only to Catholics. It is important to remember, however, that the Church recognizes as valid the marriage of two persons who are not Catholic, whether they are non-Catholic Christians or nonChristians, whether they marry in their own church or another church or with a civil ceremony. The only requirement for the marriage of non-Catholics is that there be some legitimate ceremony, that is, a ceremony which the laws of that country would recognize. Therefore, if a Catholic’s wedding was solely a civil ceremony, or ritual performed in another faith without the Church’s permission, then the union can be declared invalid. be declared invalid because of the impediment of a prior bond. The ecclesiastical laws concerning impediments, therefore, protect the rights of the individuals seeking to enter marriage, as well as safeguard the Church’s teaching concerning the indissolubility of marriage. against having children (reserving the right to exclude children from the marriage), the intention against indissolubility (reserving the option to divorce if things do not work out), and the intention against fidelity (reserving the right to have sexual relations with a person or persons other than one’s spouse). Occasionally there are incidents of “total simulation,” in which one of the parties goes through marriage for an extraneous reason, or substitutes for true marriage one’s own idea of marriage. This is most evident in the socalled “green-card cases,” in which one of the parties goes through a marriage ceremony principally and directly to gain resident status in this country, but without intending to live together permanently in a marital union. The tribunals of the Church never seek to assign blame for the breakup of the marriage. They seek only to understand a failed marriage and determine whether either or both parties lacked the proper consent or the ability to carry out that consent. In this respect, the person who presents the petition for the declaration of nullity is accusing the marriage of invalidity, rather than the other party. Unlike the Anglo-American legal system, the canonical system is not adversarial; in many cases the petitioner’s former spouse may wish the annulment as much as the petitioner does (and thus becomes, in effect, a “co-petitioner”). In each case, a tribunal seeks to understand the circumstances, both external and internal, surrounding a failed marriage to determine whether or not a valid bond was ever established. If it has been determined that no valid marriage ever took place, then each participant is free to marry, as long as other impediments do not exist. In some cases, a monitum (or warning) is placed within a decree of nullity, stating that while a certain person may be free to marry, there is concern that this person may not have the maturity or proper state of mind to enter a marital union. experience they have received. The alternative would be to have no decrees of nullity at all, but this would be a manifest injustice. So while some may claim that the procedure for annulments within the Church amounts to nothing other than a “Catholic divorce,” nothing could be further from the truth. The Church teaches us that a valid marriage bond remains indissoluble. The Instruction Dignitas connubii begins with the affirmation that “the dignity of marriage, which between the baptized ‘is the image of and the participation in the covenant of love between Christ and the Church,’ demands that the Church with the greatest pastoral solicitude promote marriage and the family founded in marriage, and protect and defend them with all the means available.” (Preface). 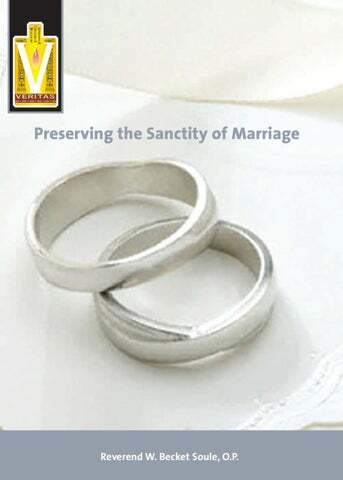 Church laws governing annulments have been put in place, therefore, not to make separations easy, but to protect the sanctity and dignity of marriage and family life, and to safeguard the rights of each individual. Dominican Father W. Becket Soule has served extensively in a variety of capacities (advocate, defender of the bond, promoter of justice, judge, and adjutant judicial vicar) in many tribunals in the United States and Great Britain. He has taught canon law, mediaeval history, and Latin and Greek at the Dominican House of Studies and the Catholic University of America in Washington, DC, and at Oxford University. Father Soule has also served as an official for the Congregation for the Eastern Churches in the Roman Curia, and as Dean of the Pontifical Faculty at the Dominican House of Studies in Washington. He is currently pastor of Saint Denisâ&#x20AC;&#x2122; Catholic Church in Hanover, New Hampshire.